King County Water Taxi riders can look forward to an upgraded facility at Colman Dock in downtown Seattle. As part of the upcoming Colman Dock Project where Washington State Ferries (WSF), the Federal Highway Administration, and the Federal Transit Administration are replacing the aging and seismically vulnerable components of the current WSF terminal and facility, King County will be building a new home on the south side with elevators and a pedestrian bridge for connectivity to the new WSF terminal, terminal amenities, and access to the Marion Street Pedestrian Bridge. 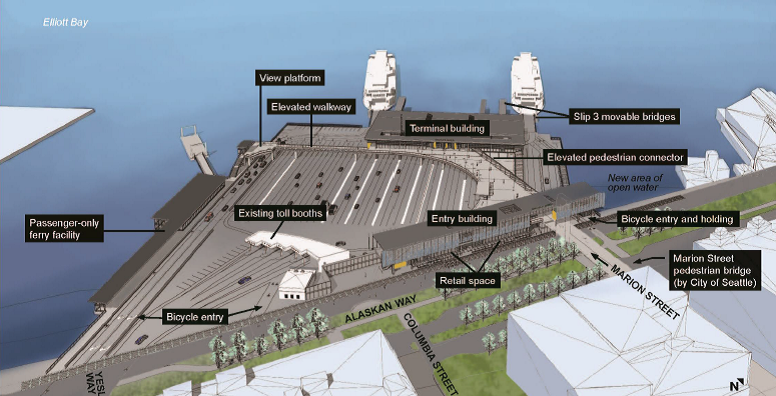 The WSF project will meet current seismic standards by replacing the timber trestle portion of the dock and replacing the main terminal building. Reconfiguring the dock layout, replacing the vehicle transfer span and vessel landing aids will provide safer and more efficient operations. 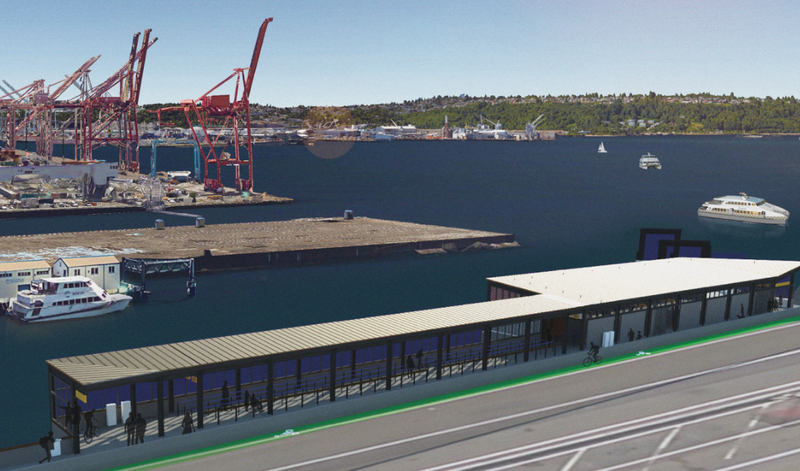 The terminal being built for the Water Taxi will offer a weather-protected queuing area for the rapidly growing ridership on the Vashon Island and West Seattle routes. The Water Taxi carried over 500,000 passengers in 2015 and has seen growth in both routes for 2016. The facility will also offer expansion opportunities for future service if the opportunity is presented. To date, King County (with WSF) has reached out to Water Taxi riders at Pier 50 for two rounds of feedback during design work in the past year and through an online open house. The design will be finalized in coming months and construction is slated to begin in the summer of 2017. The new King County Water Taxi facility is scheduled to be completed in late 2018 during the first phase of Colman Dock construction. 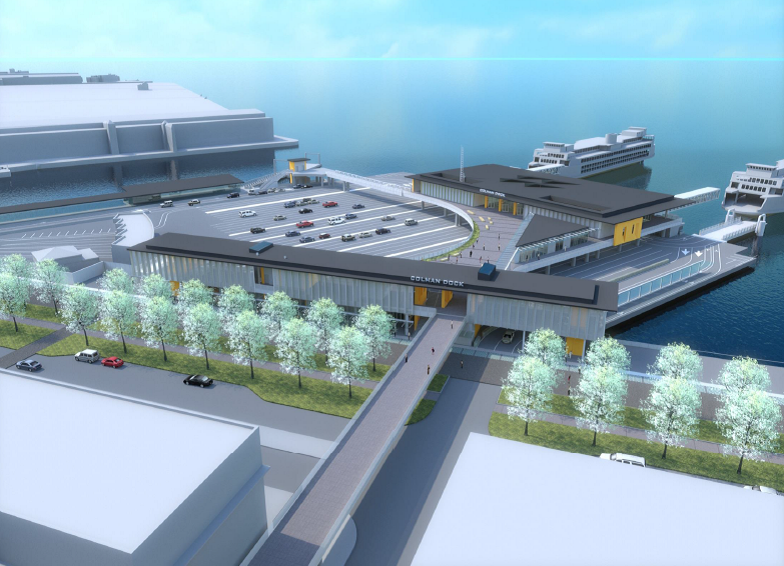 During this time, an interim Water Taxi facility will be located on the north side of Colman Dock. The WSF project is scheduled to be completed in 2023. More information is available on the project webpage or you can sign up to receive project updates by emailing ColmanDockProject@wsdot.wa.gov.